Puro Mediterraneo olive oil is produced in Italy with 100% Italian olives and from ancient and autochthonous varieties of the Salento region. The ﬂavour is lively, tasting of freshly squeezed olives. It is fruity and has a moderately bitter, yet spicy, aftertaste. Puro Mediterraneo extra virgin olive oil is fresh and natural. To preserve the taste, vitamins and properties of the olive fruit, our olive oil is made with olives pressed within a few hours of being picked. 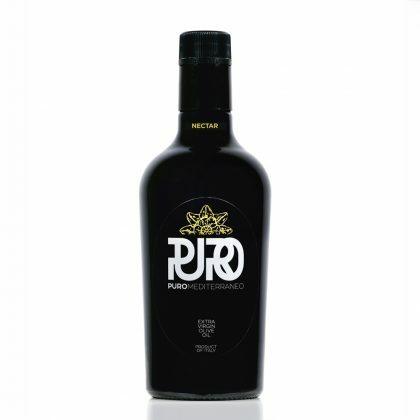 Puro Mediterraneo olive oil is good for your body. It contains high levels of natural antioxidants, particularly polyphenols. Consuming foods rich in antioxidants is good for your heart health since it lowers the risk of cardiovascular diseases, high blood pressure and strokes.